This is another of those images that I find compelling, for unclear reasons. Certainly, fall colors are beautiful. And the contrast between the red and green is striking. 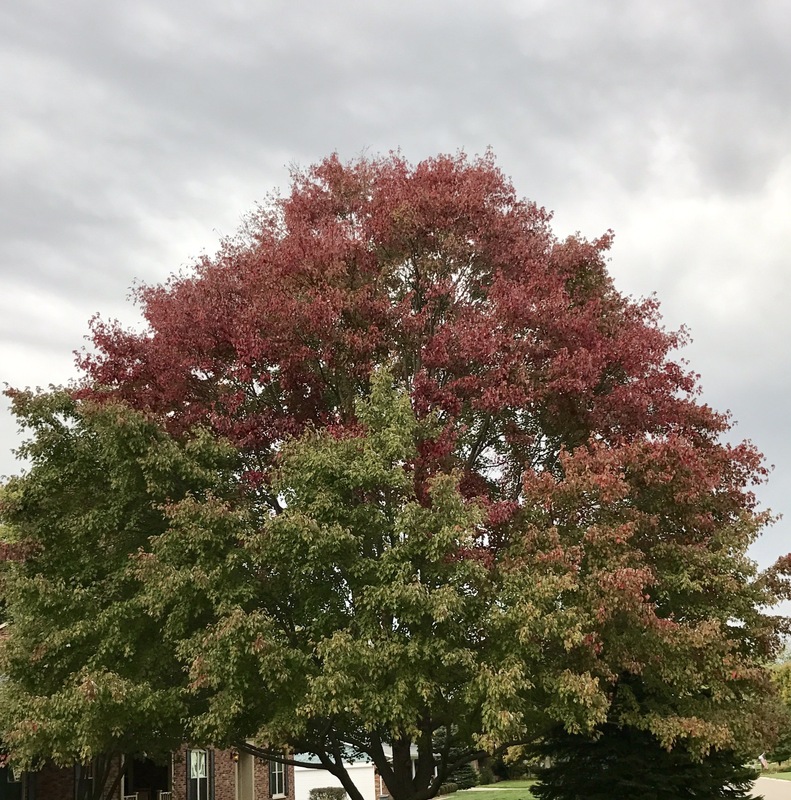 Then there is the contrast of the tree’s colors against the grey sky. There are many things I love about the fall, the changing of the leaves is definitely near the top of the list. The end of the oppressive heat. Football. The winding down of the calendar year. 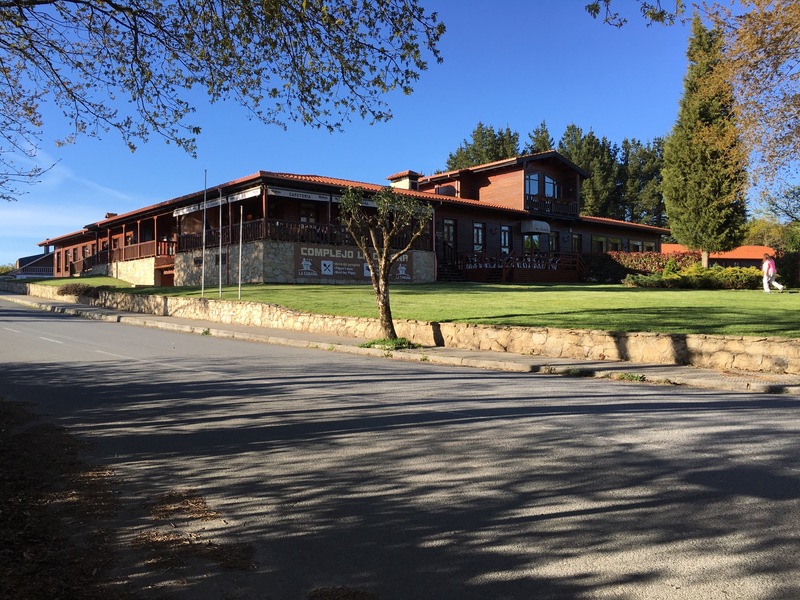 We stayed at a different hotel each night during our trip, until we got to Santiago. The places were all very different from each other; some nights we were all at one hotel and other nights we were split between hotels. Our first night was in Loyola. 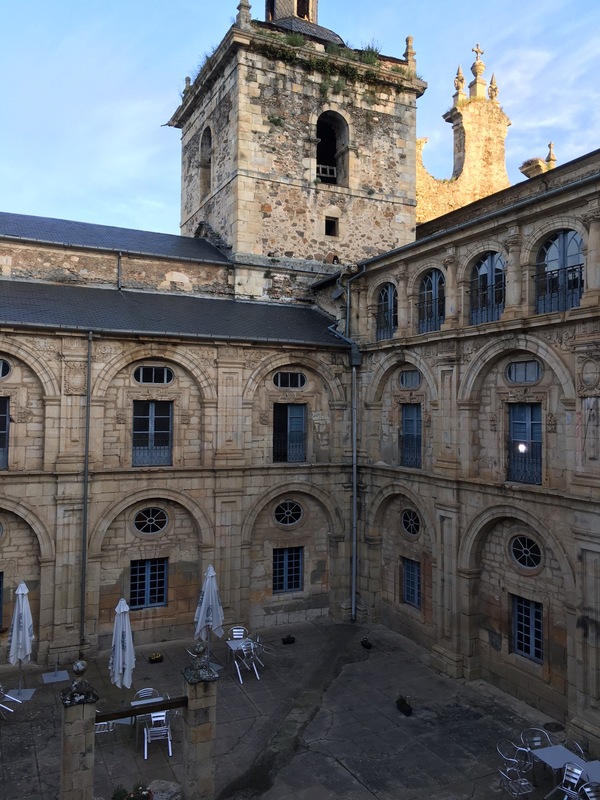 We stayed next to the cathedral in a former monastery. 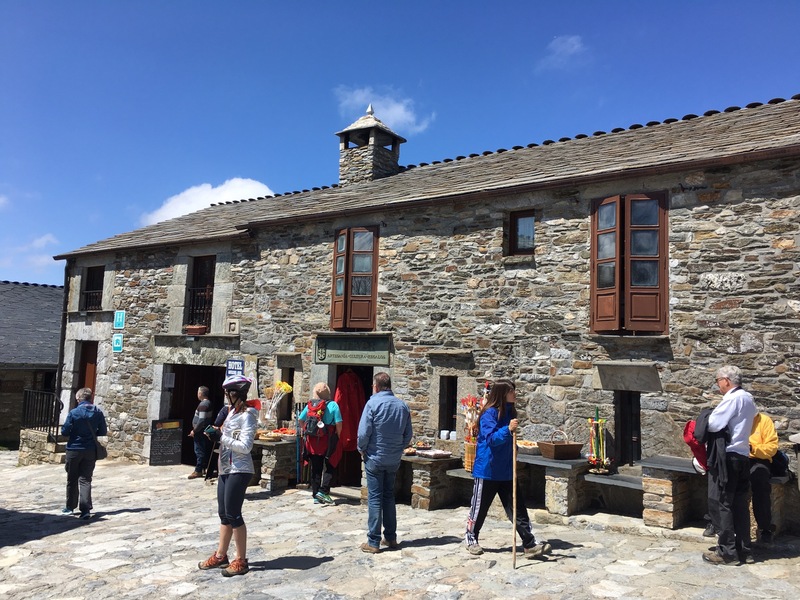 The next night, the evening before we started hiking, we were at another former monastery in Villafranca del Bierzo. After our first day of hiking, we stayed in one of the nicer (and newer) places. 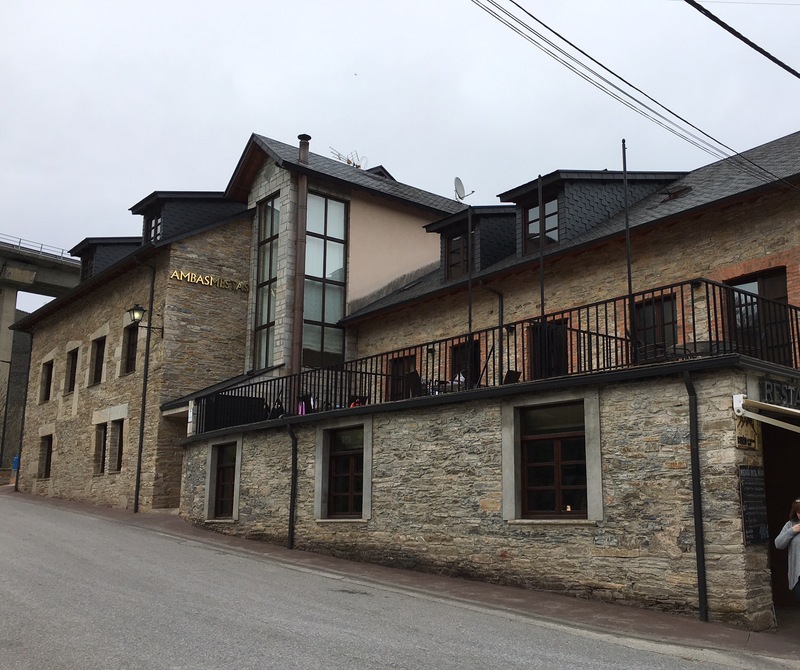 Our next night was in O’Cebreiro, in one of the more unique places we stayed. On the second floor, over the bar. 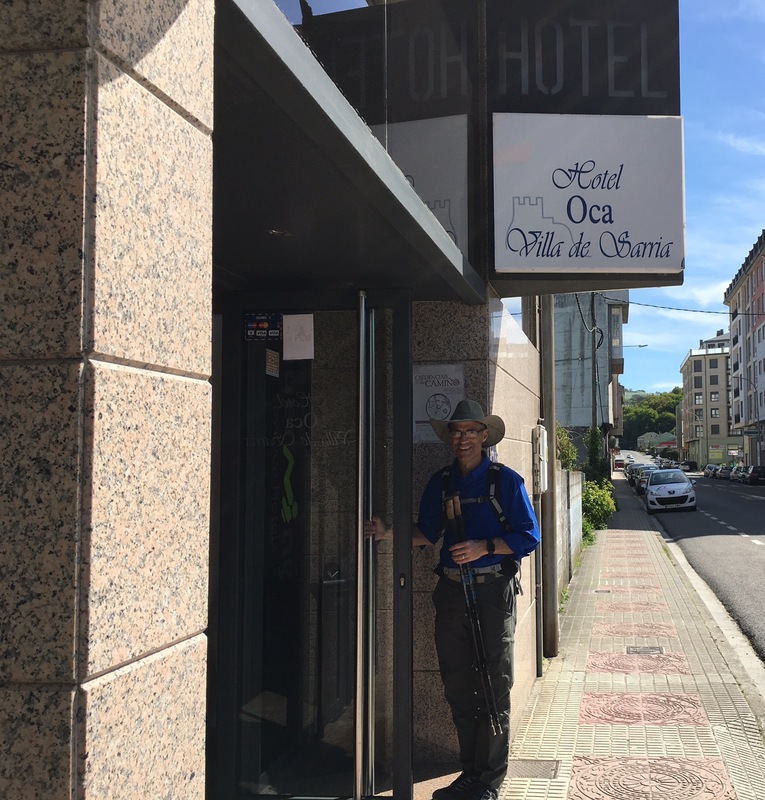 The group was split between two different hotels. 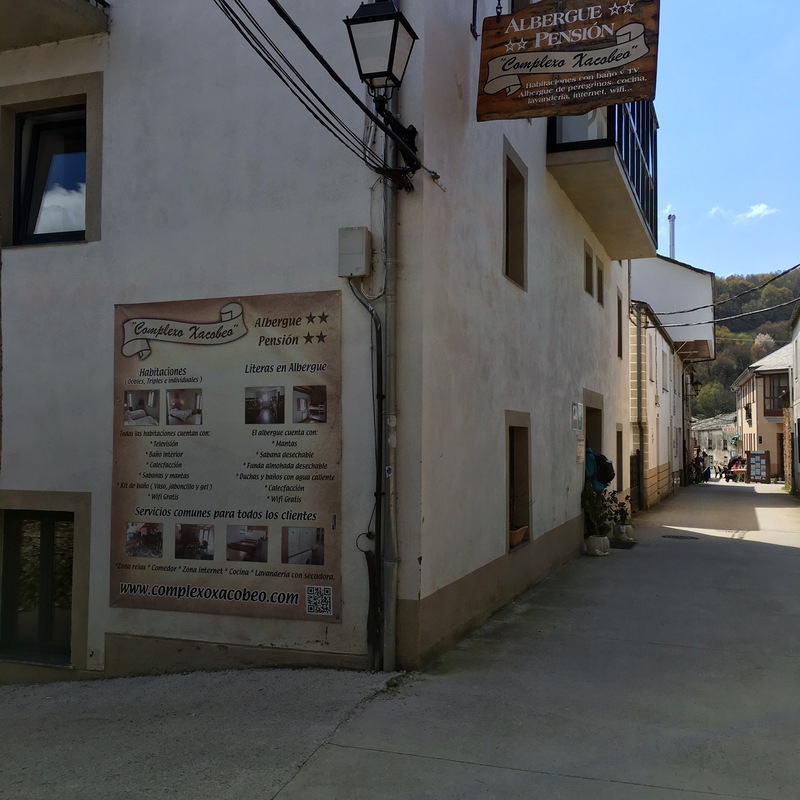 Our next stay was in Triacastela in what seemed a maze of rooms. The restaurant for the complex was a short walk down this street. This was the second night the group was split, with a few staying at what sounded like a former residence. 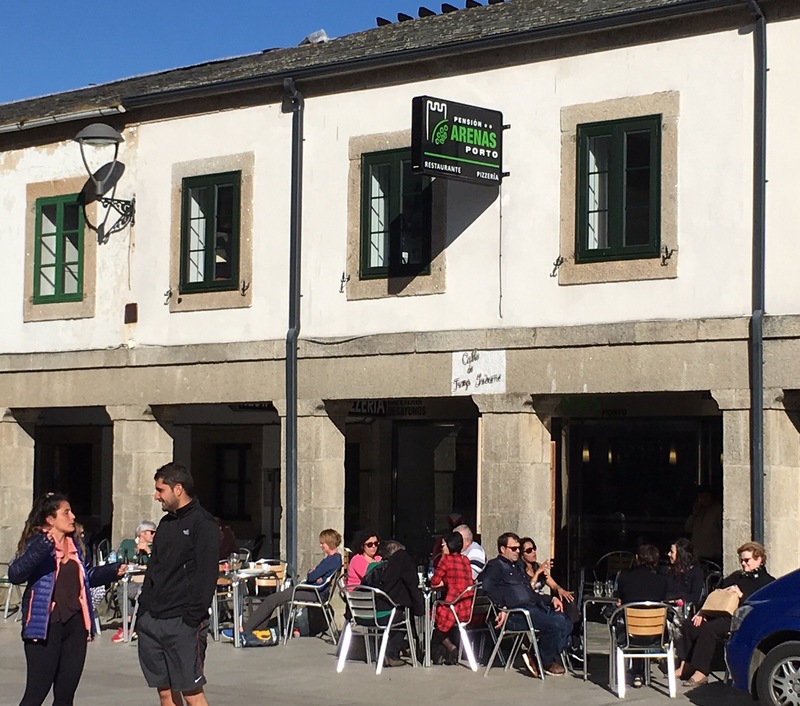 The following day we hiked to Sarria, vía Samos (where there was a large monastery). This was one of two hotels we stayed in with an elevator. Portomarin is a town on a hill that was literally moved from the valley below when a dam was built and the valley flooded for a lake. The church was moved block by block. Our hotel was right across the “street” form the church. The group was split again this night; don’t know much about the other hotel. 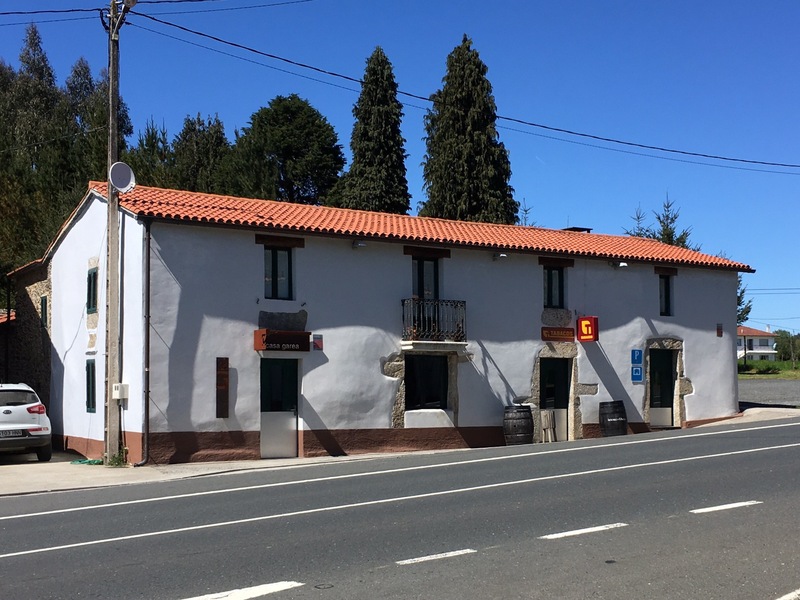 When we arrived at our hotel in Palas del Rei, there were already a few people from the group sitting on the porch seen at the left front of the picture below. It was quite the party, complete with a clown (nose)! After celebrating mass that night, we came back and had a birthday cake for Father Michael on the porch. 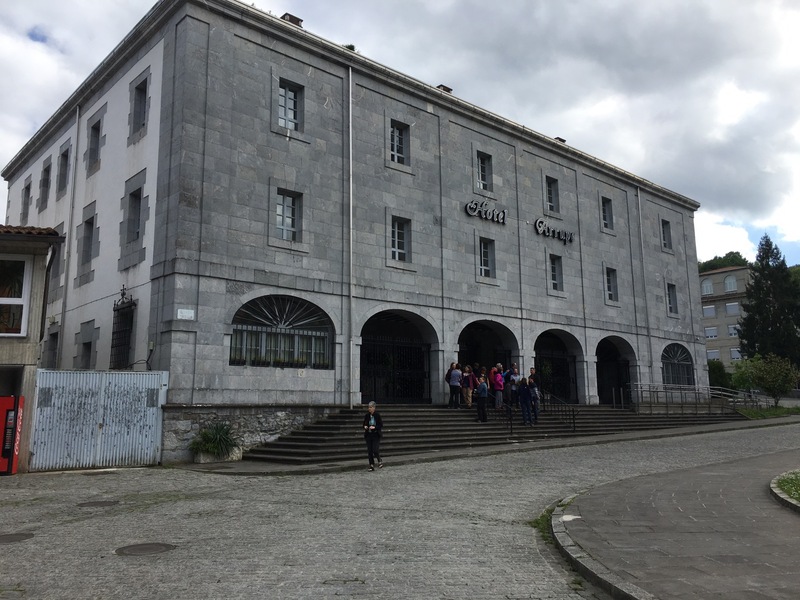 The most difficult day of hiking (see previous post titled “Expectations and Disappointments”) ended with a search for Casa Garea. Most of the group stayed at Paso Sedor, a restored mansion. Casa Garea was a little simpler. Maybe 6 rooms and a bar/country store. Possibly the low light of the trip was the next morning when a few pilgrims got “locked in” when we were trying to head out for an early start hiking. Our final night before arriving in Santiago was at a fairly modern building; the other one that had an elevator. 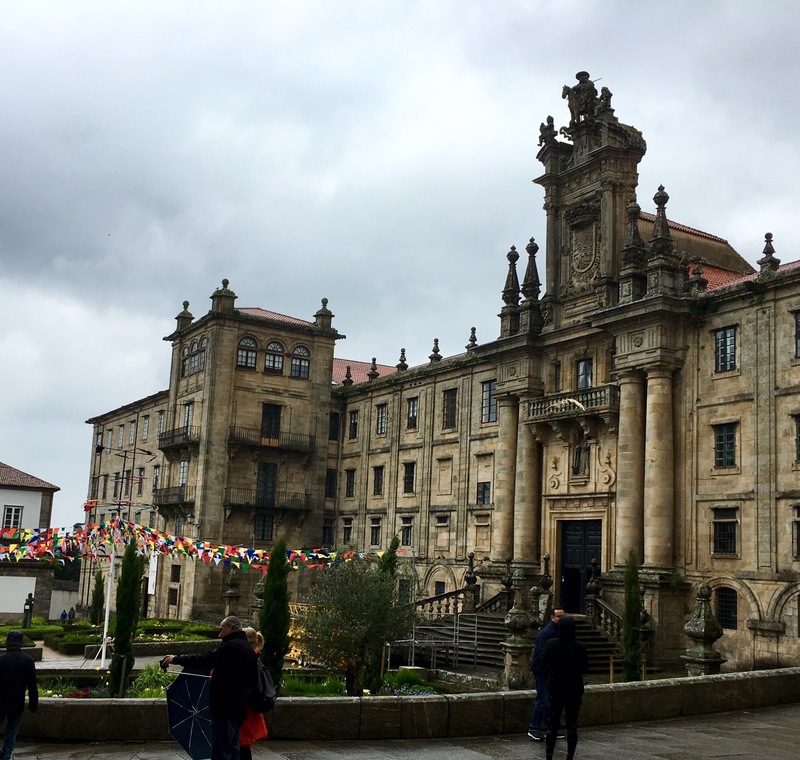 Our nights in Santiago were spent at another former monastery, much larger than the other places we stayed. 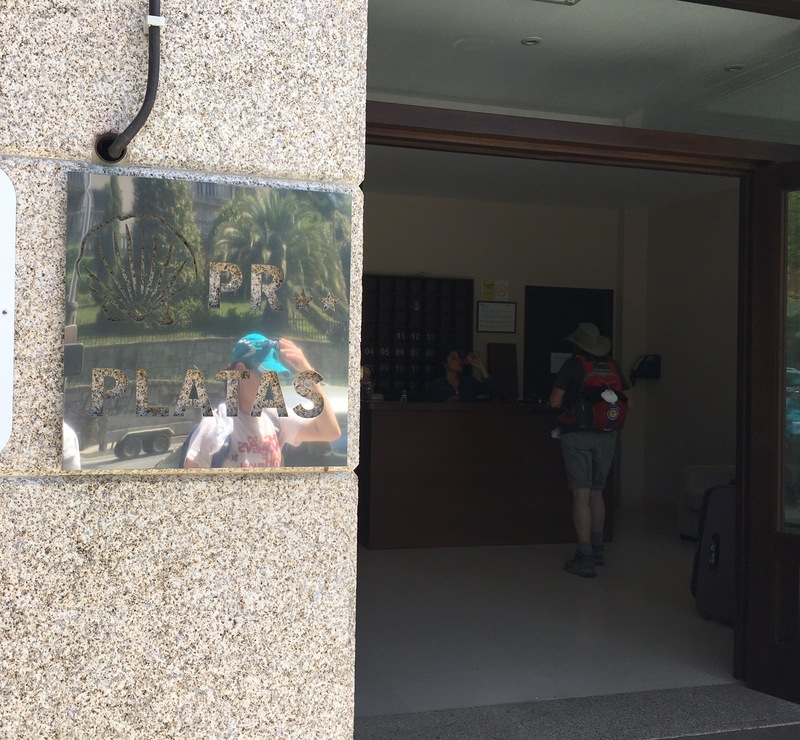 As we talked about the various places we stayed, one overriding thought was how grateful we were to have reservations each night, selected by the tour company at reasonable to very nice hotels. There was comfort each afternoon knowing that a room was “waiting” for us.